Here goes the easy breezy scrumptiously inviting buttered corn recipe. This kids favorite snack is very quick to prepare, tasty and healthy. As the main ingredient is sweet corn, it makes an excellent combo with butter, salt and pepper. The juicy sweet corns with sticky sweet and buttery flavor makes a party favorite snack too. Try out this easy video recipe today. Add cooked corn kernels and saute. Once the corn gets coated well with butter, add milk. Allow to cook for few minutes. Add pepper pwd, red chilly flakes and chat masala pwd. 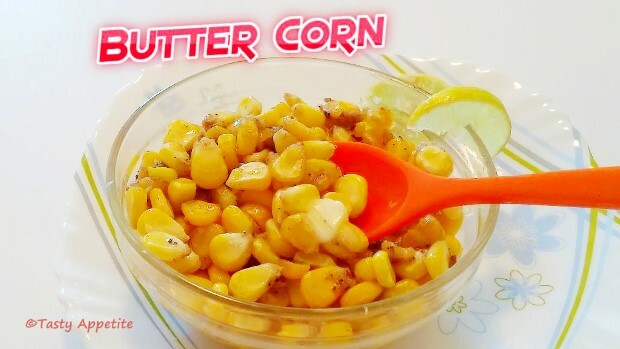 Aromatic healthy delicious butter corn is ready. Transfer to serving bowl and enjoy hot.